A guest post by Leslie Long. PCAN welcomes (ahem, encourages) your contributions on any preservation or conservation related topic. To submit a post, email us. Institutional budgets are tight, but that is no reason to deny employees meaningful training opportunities. There is more than one way to increase staff savvy. It’s funny how easily we can be talked into the notion that work can’t be fun. Our lives are moving along at the same speed at work and at play, though sometimes work time seems slower. Why not think about enjoying ourselves while we complete our tour of duty? And why not continue to learn new skills in spite of zero dollars for training? Holly Robertson, former Head of our Collections Conservation Section (CCS) at the Library of Congress, introduced afternoons of fun to our staff. These are opportunities for any staff member to teach the rest of us some skill related to the work of book conservation. What concept better characterizes the team building and skill sharing spirit that is the heart of every excellent preservation staff while at the same time proving that learning can be fun and cost-effective? Our first CCS AOF teacher was Preservation Technician, Melissa Blaschke, who taught us all to make paste papers in a single afternoon. Melissa prepared a short history of the art of paste papers and a clearly written sequence of steps to follow, but the real fun was gathering around her and persuading her to demonstrate for us, then going off on our own to create. Then, gathering to admire each other’s creations. I believe everyone on our staff would agree that the work we do is rewarding and meaningful, that we have nice people to work with in a pleasant work environment. Still, in a production setting, focused on turning out many batches of the same repairs each year with a weekly afternoon or morning running hundreds of machine-made boxes thrown in, the afternoon of paste paper creation provided an oasis of creative learning, and dare I say it? FUN! Melissa’s paste paper afternoon and a later clamshell box making by hand afternoon that I coordinated and instructed cost our institution nothing in training fees. She and I already knew what we taught. The staff time used for the afternoon of fun classes, approximately three hours each for eight staff members, can be compared with the cost of travel and training for those staff members to attend classes, even when instructors from outside the Library are hired to teach those classes in-house. 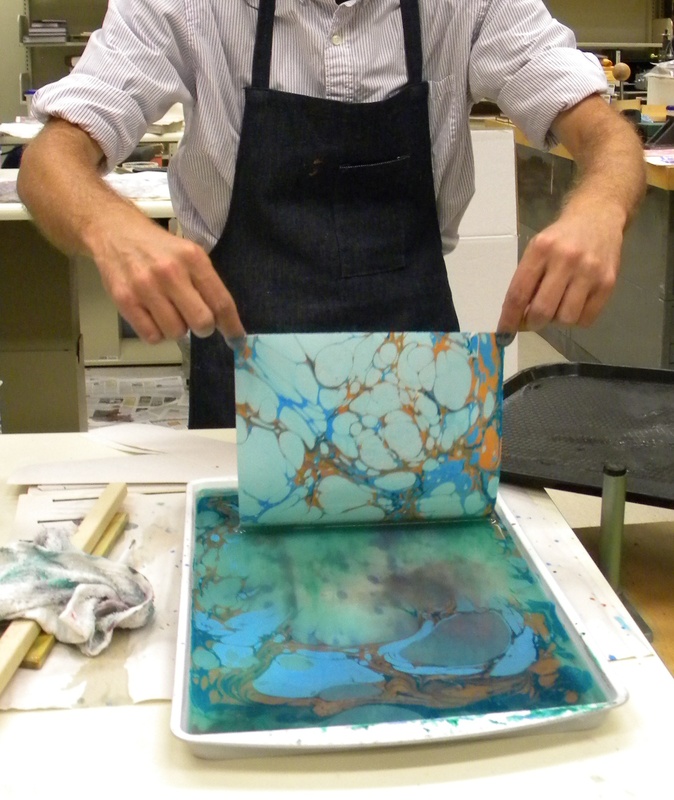 The funding I received for a weekend paper marbling class with Galen Berry became an afternoon of fun for our staff, marbling papers using patterns I had learned in that class and in a second class with Regina and Dan St. John, that I paid for myself. Some staff came in on their own time on a Saturday to practice marbling after my class, and a few explored advanced patterns outside the scope even of the challenge patterns I added to my handouts. Then, they taught me as all my students eventually do. We all learned the names of the basic marbling patterns used on endsheets and book covers that we encounter every day in our book repair duties, how each pattern is made, and a bit of the history of marbling. And we learned it together. Teaching an afternoon of fun is as much fun as being a student in one, and both can reveal talents that might otherwise go undeveloped. I’m certain the next afternoon of fun instructor from among us will step up with a class that will enlighten, unite and entertain us. And what could be wrong with that? Leslie Long is a Preservation Specialist in the Collections Conservation Section of the Binding and Collections Care Division in the Preservation Directorate at the Library of Congress. The ever thought-provoking Kevin Driedger wrote this essay for us back in October. Apologies to Kevin for taking so long in getting it posted, and a great big THANK YOU to him for his patience and for writing this post. When Kevin’s blog Library Preservation shut down, an important voice was quieted…but only for a little while. Great news! He has started Library Preservation 2 . We welcome him back with great enthusiasm and look forward to reading his posts. This phrase seems to go against what we feel we are to be about – preserving items and collections permanently, or for a really long time, or for some time after they are no longer useful, or at least until after I’m dead and gone. To acknowledge that all things, including the items I am skillfully and carefully working on, are impermanent is an act of humility on behalf of the conservator. It is to acknowledge limitations. A conservator can do things to lengthen the useful (or non-useful) life of a book, but a conservator cannot make the book(1) permanent. The death of a library book is seen as a conservation failure, although the fault causing the failure is usually not assigned to the conservator but to poor materials, poor construction, improper handling, or bad environment. Somebody did something wrong. With a capable conservator in charge at the book’s inception, to its use, its storage, and any necessary remedial activity, the book would still be around today. I don’t find much discussion in the conservation literature about how long library items should be kept – conservation literature is most often geared to how to conserve things, not what to conserve or when to stop conserving and pronounce the book dead.